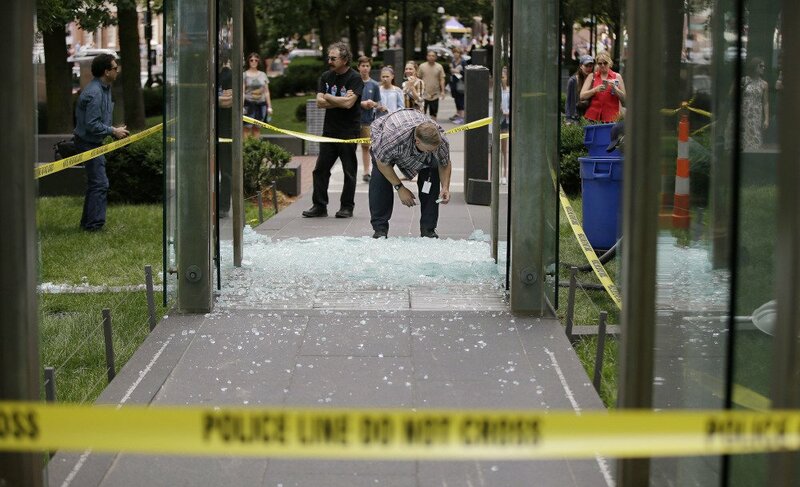 The court-appointed attorney for a man charged with the crime says he is mentally ill.
BOSTON — A man suspected of using a rock to shatter a glass panel on the New England Holocaust Memorial is mentally ill, his lawyer said Wednesday, as elected officials and religious groups came together to condemn the vandalism. “As a city we stand with the Jewish community,” Boston Mayor Marty Walsh said at the memorial. Police responding to a call from a witness at about 2 a.m. found a roughly 9-foot-tall glass panel on one of the memorial’s six 54-foot-high towers shattered. They quickly arrested James Isaac, 21, of Boston and charged him with malicious destruction of personal property and destruction of a place of memorial. “When we hear the sound of broken glass, we shudder,” said Barry Shrage, president and CEO of Combined Jewish Philanthropies, referring to Kristallnacht, a wave of anti-Jewish violence in Germany in 1938. Israel Arbeiter, a 92-year-old Holocaust survivor who played a key role in building the memorial, showed the tattoo he received from the Nazis on his arm. “The Jewish people are strong. The city of Boston is strong,” he said. Isaac was held on $750 bail at his arraignment but had his bail revoked for violating the terms of his probation in other pending cases. Not-guilty pleas were entered on his behalf. His court-appointed attorney said her client suffers from mental health issues and is in a partial hospitalization program. The Massachusetts chapter of the Council on American-Islamic Relations also denounced the vandalism. “Desecration of a religious memorial is always heartbreaking and must be condemned,” chapter Executive Director John Robbins said in a statement. The memorial designed by architect Stanley Saitowitz opened in 1995 and is located just off the Freedom Trail, near Faneuil Hall and City Hall. It is open at all times. The glass towers are lit internally and etched with millions of numbers that represent tattoos on the arms of many Jews sent to Nazi death camps. Extra panels were made and stored when the memorial opened, and the organization that oversees the memorial did not expect repairs to take long.